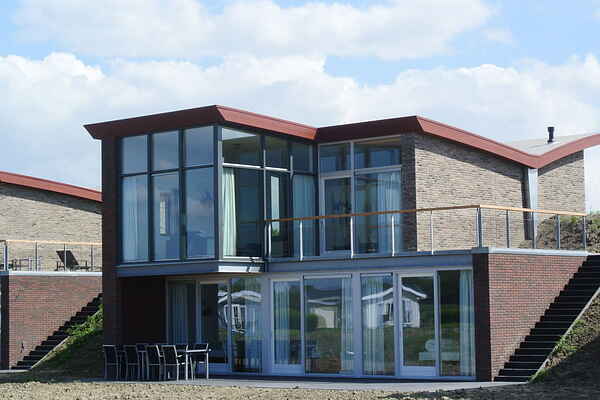 The Dike Villas at Waterpark Veerse Meer were developed in 2012 and are high quality. Not only the unique design, but also the finish are proof of this. The villas are half built into the dike, with huge windows at the front. This provides a wonderful view and light from the living room on the first floor. The accommodations are available in various types. You have the choice of a 8 person Comfort (NL-4341-11), an 8-pers. Luxury (NL-4341-12), a 9-pers. Luxury (NL-4341-13), a 10-pers. Comfort (NL-4341-14) and a 10-pers. Luxury (NL-4341-15). All types have a sauna and a sun shower. Every type has a balcony and a terrace. The garden furniture provided also has 2 lounge chairs.